In recent years a startling policy innovation has emerged within global and domestic environmental governance: certification systems that promote socially responsible business practices by turning to the market, rather than the state, for rule-making authority. This book documents five cases in which the Forest Stewardship Council, a forest certification program backed by leading environmental groups, has competed with industry and landowner-sponsored certification systems for legitimacy. The authors compare the politics behind forest certification in five countries. They reflect on why there are differences regionally, discuss the impact the Forest Stewardship Council has had on other certification programs, and assess the ability of private forest certification to address global forest deterioration. Cashore, B. (Benjamin), Auld, G, & Newsom, D. (Deanna). (2004). Governing Through Markets: Forest certification and the emergence of non-state authority. 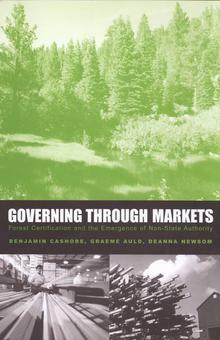 Governing Through Markets: Forest Certification and the Emergence of Non-State Authority (pp. 1–327). Yale University Press.